We all are living in “the age of the customers,” where customers are the driving force of any business decision. Companies are no longer the kings of markets. The customers have swept away all the attention from the companies and this has happened all because of the different and many options available to the customers. They are more diverse in nature and scattered over regions than ever. They are no longer loyal to one brand. And they are more wanting in terms of quality, experience, and services than before. Now, all these things really demand the businesses understand their customers on a deeper level. 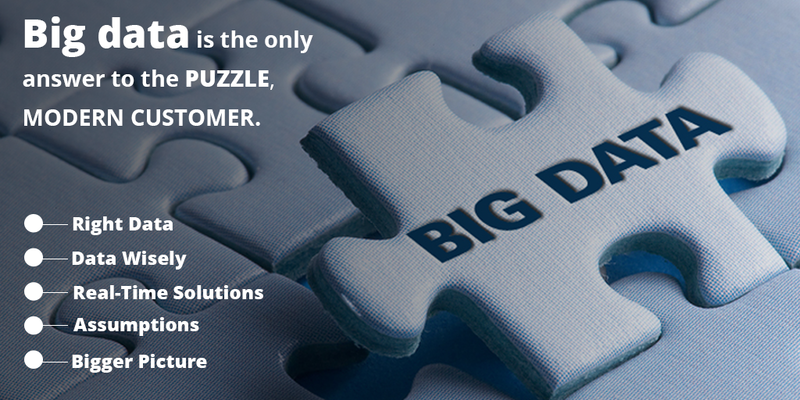 And in the era of online businesses, big data can only be a savior. Through the right processing of the plethora of data, the key insights can come out which can really help to understand the customer psyche better. The businesses just need to consider the following things. Collect the right Data: First of all, it is completely necessary to have the right data. Treat your network traffic as ‘Gold Mine’ because it contains a wealth of data but it is not the size of the data which matters. The importance is of the right data on processing of which some real data points come out. Using big data algorithms we can clean up or normalize the data. For example, we all know Uber is a big-data success story which has wealth of information but its applications keep running to map out the right data. Use the data wisely: Now, if you see carefully the right data is generally the small part of big data which actually drives the competitive position of your business. This small critical pieces of data should be cleverly aggregated to get more right information based on some particular variables. Just as Uber said, you need the small and right data to do something very simple and significant. Use real-time solutions: When the businesses operate in real time than the technology used should also not lag behind. There should be scalable structure to handle the velocity, volume and variety of complex data. Identify the structural and performance bottlenecks to ensure acceptable system performance during high volume traffic. Technology should be updated to ensure high availability of data for real-time updates and should be able to translate data into more presentable and accessible way. The marketing strategies should be formulated accordingly, keeping in mind that the solutions worked in past need not work now. Do not make assumptions: This is a basic business philosophy which says that never assume anything about your customers. Customers are very fickle minded and their beliefs or choices keep evolving with every passing day. Businesses need to collect, analyse and visualize data in order to find out meaningful patterns in it so that they can deliver what exactly customer wants. Preparing Intelligent reports after extensive data processing is suggested so that they can easily understand the actionable insights from the data. Look at the bigger picture: Every single transaction of customer gives an opportunity to learn more about them. Just don’t see the periphery picture, go deep into analyzing it, for example, while keeping the record of the purchasing behavior, customer’s preferred channel of placing an order or preferred method of payment can be known. Their general online web behavior can be studied. Businesses have to be really wise in connecting the dots so that they can take a better decision for the improved performance of business. Thus, the data is there, the technology is also there, but making the right use and drawing out right inferences from it is the real game! Big Data: Dead or Alive? Where and How is Big Data Bringing Change to Security Analytics?